Most people would assume that weight is too simple for its own article, but when it comes to shipping, weight is surprisingly complicated. In addition to what carriers call the actual weight — the kind measured by placing your package on a scale — shipping also involves two other types: dimensional weight and billable weight. Understanding each of these and how they work is important if you want to reduce your shipping expenses. As you probably know, carriers weigh your shipments because it costs more to ship something heavy than something light. However, it’s also more expensive to ship a larger package than a smaller one, even if the smaller one is denser and has a higher actual weight. While actual weight is used to calculate the cost of shipping based on, well, the actual weight, carriers use dimensional weight to do so with physical size. In fact, dimensional weight is based purely on the dimensions of the package, but the final number is calculated as a weight unit, either pounds or kilograms. To find the dimensional weight of a package, carriers measure each side at its longest point. That number is then typically divided by a specific factor — known as the dimensional factor or dimensional divisor — to obtain the final dimensional weight. When using the imperial system (Lbs & Inches), most carriers use 139, but it becomes 5,000 in the metric system (CM's & KG's). Remember, this number varies by carrier and can vary by service level as well. This formula involves a little too much math for me, but luckily the online Dimensional Weight Calculator from FedEx will quickly let you know the value for your package. Remember that for irregularly—shaped items, you need to measure each side from its longest point, as that’s what counts during shipping. If your package has a sloped edge or side, measure it as if it was straight on all sides. The image on the right displays how an item that’s actually smaller than another can still have a higher dimensional weight. A great way to save money is to shape your package as regularly as possible — since it’s measured only at the longest point in each direction, any irregularities will result in additions to your dimensional weight. If you’re looking for more methods of reducing costs, look at Shipping 105, which covers some simple ideas to integrate into your shipping protocol. It might seem strange that dimensional weight is measured in pounds or kilograms — it’s a number entirely derived from size. 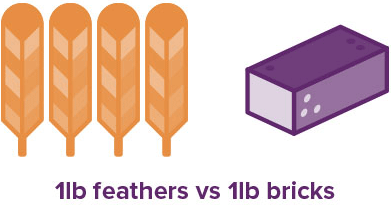 Essentially, carriers use dimensional weight to charge customers based on how much their packages cost to ship, so that a heavy, small package isn’t more expensive than a large one that’s extremely light. Once the dimensional weight has been calculated, the carrier compares it to the actual weight — whichever is higher becomes the billable weight. Take, for example, a 12 by 12 by 6 inch package weighing 5 pounds. 12 times 12 times 6 divided by 139 is 6.2, and since carriers round to the next whole number, the item’s billable weight would be 7 pounds. Generally, a denser package will be billed based on its actual weight, while dimensional weight will be applied to larger, less dense packages. Things become even more complicated when you’re shipping more than one package. Some carriers, like UPS and FedEx, measure all your boxes to come up with one billable rate. On the other hand, carriers such as CanadaPost will simply charge you for each piece as its own shipment. This can result in higher costs, as individual shipments often come with minimum rates. Check your carrier’s rate guide or website before shipping to ensure you’re getting the best deal possible. You can also use our Shipping Rate Calculator to compare rates and services, and it will automatically find the billable weight of your package(s). Some carriers have a separate policy for extremely large items, and this can result in additional costs. UPS, for example, classifies a package as large if its width and height combine for more than 130 inches or 330 centimeters, and large packages are automatically given a billable weight of at least 90 pounds or 41 kilograms. FedEx simply charges a surcharge of $12 on any package whose largest side is longer than 48 inches (122 centimeters) but shorter than 108 inches (274 centimeters). This is known as the Additional Handling Surcharge. Be particularly careful not going over the maximum size or weight with any carrier you use or you can face hefty oversize/overweight fees. FedEx and UPS small package division can only carry packages that are no larger than 165 inches in combined length and girth, has a length of longer than 108 inches, and is 150 Lbs or less in weight. With UPS Canada, that fee is currently $650 for handling a package over 150 Lbs and there's a good chance they'll return that package back to you. Since these fees can add up quickly, it’s worth checking the rate guides to make sure you’re not paying extra unnecessarily. Weight, dimensional weight, billable weight — they all have different meanings in the world of shipping. The weight is simply the actual weight of the package. The dimensional weight is the carrier provided formula to use to obtain a weight equivalent (ie. each box size has an associated weight to it). The billable weight is the final chargeable weight — the weight or the dimensional weight, whichever is higher. You still need to be aware of some of the policies involved-that multiple packages are viewed differently by different carriers, and large parcels are generally priced under their own set of rules. Additionally, if you fail to measure your items at their longest points, you could be surprised by the final cost. Taking these into account, you should be able to reduce your dimensional weight and final price. For any other shipping-related questions, check out our support page, which covers a list of frequently asked questions and allows you to ask ShipGuru any questions you have about the shipping process.